Can I use the JX44 without the footswitches? Yes. The front panel has all of the controls to let you do most tasks. Is there a way to remotely control the effects send & receive port? Yes. You can program the JX44 using one of the amp channels as a return path to turn on or off the effects. Simply turn this on with the other active amp to hear the effects. 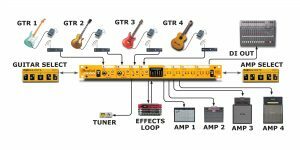 Can I insert an external effects controller if I want to use four amps on stage? Yes. By using a device like the Radial BigShot EFX™ you could activate effects. The EFX is a cost effective footswitch controlled pedal that lets you introduce two different effects loops into the signal path. You could also use the Loopbone, a more advanced version of the same type of loop controller. There are two inputs for channels 1 & 2 on the front and rear panels. How do you select which input is active? The front panel jacks have priority. This means that normally, you would connect the guitar using the back panel jacks. If you needed to connect a guitar in a panic situation, the moment you connect the cable plug into the front panel jack, the input diverts here. Could I stack two JX44s together for a crazy set-up? Yes. Just use one of the outputs or effects send-return busses and have fun! 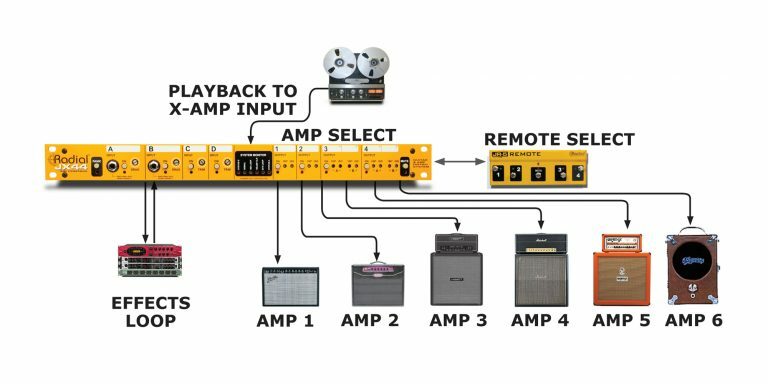 Reamping is a recording task that is used to replace or augment guitar tracks. What you do is record a dry track using the JX44’s balanced DI output while performing as normal. Afterwards, take the recorded dry track and send it back into the JX44 using the X-Amp input and send the signal back through your amps and pedals. This process has been used for years to fix bad notes, improve the tone and thicken tracks. Can you explain how the SGI-44 works? The SGI-44 or studio guitar interface is a dedicated transmit & receive device that takes a guitar signal and lets you send a long distance guitar pedals or even a remote amplifier. It balances the signal and lowers the impedance to avoid noise and signal loss. Does the Drag Control™ also work on wireless guitars? No. 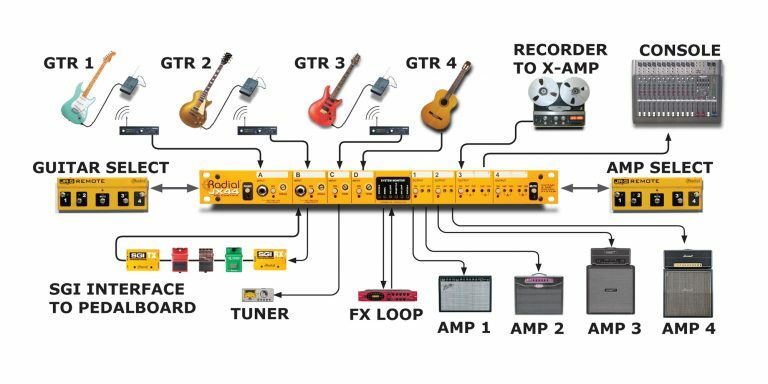 Drag Control is designed for regular passive guitar pickups. 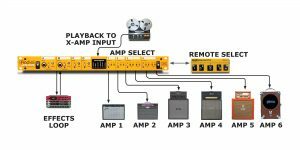 Because acoustic guitars and wireless systems are already buffered, the load correction circuit will have little or no effect. Why did you choose to use those darn wall warts? The Radial JX44 is sold to countries around the world. This means that each country requires safety approvals and varying voltages to suit. The external power supply option is not ideal, but it allows us to ship a single production unit to all of these places without incurring huge approval costs such as UL or CSA in each country. Another reason is that power supplies are noisy and prone to failure. Taking it out of the box means that the JX44 will be quieter and if ever it fails, it can easily be replaced. Actually… the ¼” connectors we use are glass filled nylon and tougher that steel! We use ‘plastic’ so that we can completely isolate each of the channels and reduce noise. A full ground plane is employed and we build a virtual ground inside the JX44 to further advantage noise reduction. What Radial DI box is built into the JX44? It is the same DI circuit that we employ in the Radial ProDI™, ProD2™, ProD8™ and SW8™. In other words, it is a transformer based design that is highly effective, very linear and proven to perform well. What is the signal path difference between the JD7™ and the JX44? Both share the same active circuit. The ‘studio-centric’ JD7 utilizes Jensen™ transformers while the ‘live’ JX44 employs a special order isolation transformer. The JD7 is one step better but due to the limited space, added electronics and nature of live touring, the JX44 is certainly well appointed. Who are some of the artists that use the JX44 on tour? The Eagles, Slayer, Devin Townsend, The Killers, Keith Urban, Despised Icon, Shinedown… many. 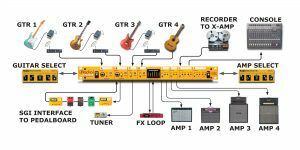 Is the effects loop in the JX44/JX62™ wired in series or parallel? The effects loop is wired in series. You may add a Tonebone BigShot Mix™ to achieve parallel processing.